When I had my mum over this weekend for brunch I knew dessert was essential. I decided to make these champagne cupcakes to balance out the dense bagels. The cupcake has the perfect amount of champagne and the whipped cream frosting is a light addition, and creates the quintessential flavor balance. I topped each cupcake with white chocolate. I think these might be essential for New Years Eve parties. 1. Preheat the oven to 325 degrees. 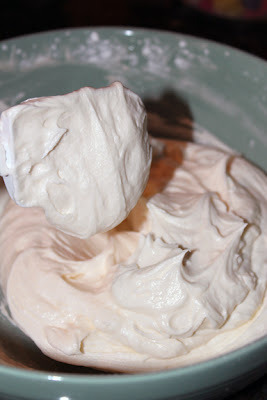 Using a standing mixer or hand held mixer, in a bowl cream together the butter and sugar until light and fluffy. Add eggs one at a time beating well after each addition. Add in the vanilla and mix well. 2. In a separate bowl, whisk together the flour, baking soda, baking powder, salt and set aside. 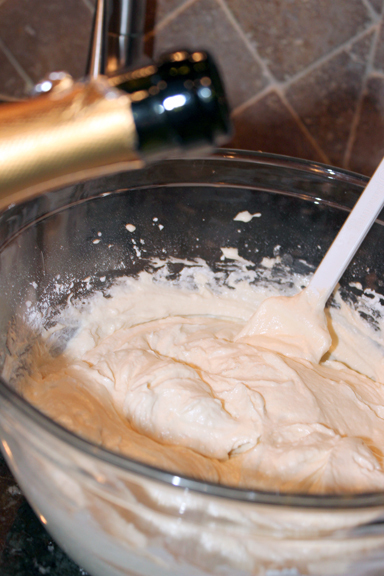 In another bowl (medium sized) whisk together the champagne and and sour cream. Add the flour and champagne mixture alternately, beginning and ending with flour to the egg mixture. This batter will be thick. 4. Fill cupcake liners with 1/4 cup of batter and bake for 15-20 minutes or until a toothpick inserted in the center comes out clean. 1. In a large saucepan bring about an inch of water to a boil. Meanwhile, in a 1-cup heatproof glass dish (I used a measuring cup) combine the cold water and gelatin. Allow to stand for 2 minutes. Place glass dish in the saucepan of boiling water. Cook and stir about one minute or until gelatin is completely dissolved. Remove glass fish from water, set aside and allow to cool for seven minutes. 2. In a chilled large mixing bowl beat whipping cream and sugar with the chilled beaters of an electric mixer on medium speed while gradually drizzling the gelatin mixture into the cream mixture. Continue beating the cream mixture until stuff peaks form (tips stand straight). Makes about 4 cups. These seriously sound AMAZING, and what a perfect idea for a brunch dessert. I cannot wait to try out this recipe. holy cow those cupcakes sound delicious. these sound SOO GOOD! Have a happy Tuesday and be sure to check out this low entry giveaway ending soon :). O. M. G. These look amazing! OMG these look heavenly!!! I'll be hosting a bridal shower in the next few months and these will be perfect. I might just have to try them before! :) I agree that they would be perfect for NYE. Thanks for sharing this yummy recipe. I'll be pinning it! Oh my gosh, I LOVE champagne! Those look absolutely delish! Yummy - these sounds delicious! I'm want to try these soon! Champagne mixed with sugar, yes please! Yum yum! I love champagne so I am sure I would love these! These would be cute with little silver or the mini white balls on top for "bubbles". those look delicious!! I'll have to try! Yummm!! These look delicious!! 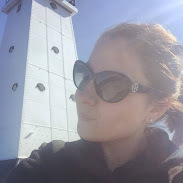 Thanks so much for stopping by my blog ... I love meeting new friends!! Following your blog now, too! !